I visited Oxford last weekend, for the first time ever! It was awesome; sunny and hot, we watched some rowing (I hate rowing but the atmosphere was great, I got a tan and there was Pimm’s), had a barbecue and saw lots of colleges. Oxford really is very pretty. We found (with some help!) 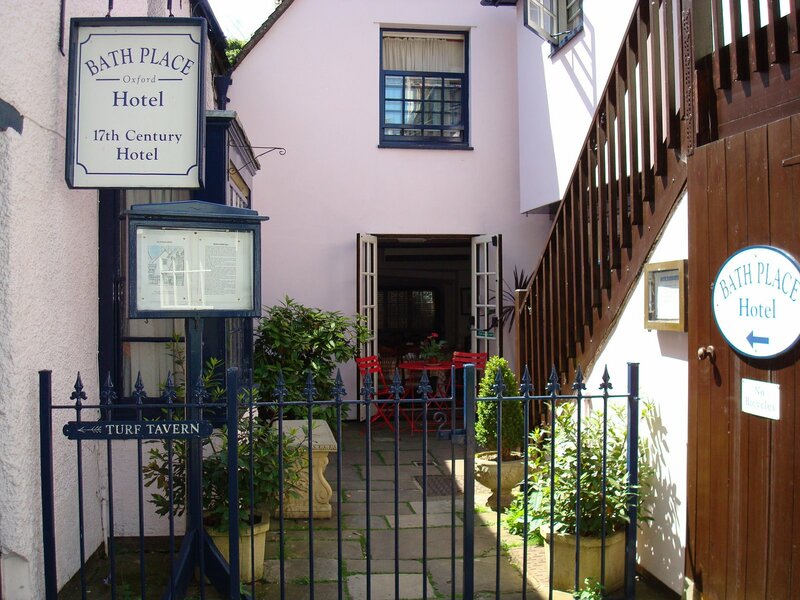 a hidden pub that apparently lots of famous people have visited. We had to walk down a little alleyway to get to it. Disappointingly, it was another Greene King pub, but it still had lots of atmosphere and the extra element of mystery to it. We had a drink there and on the way out we saw this little Hotel entrance, which I found very pretty and ever so slightly french looking. 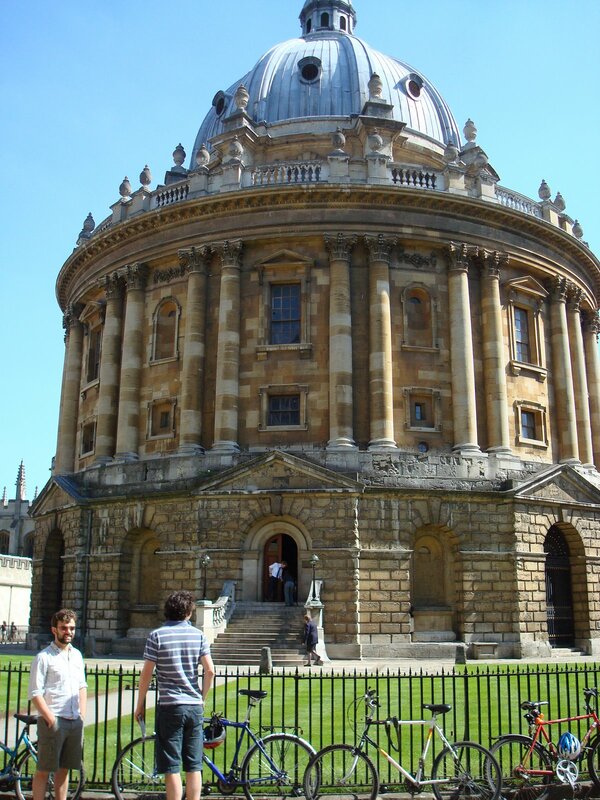 Oxford feels more like a city than Cambridge does but without looking industrial or dirty. Also, it doesn’t have a phallic-looking University Library, which is always a bonus. Anyway, food! On the way back, we stopped at this pub just out of Oxford. First impressions were great. It has a huge garden (and a playground!) 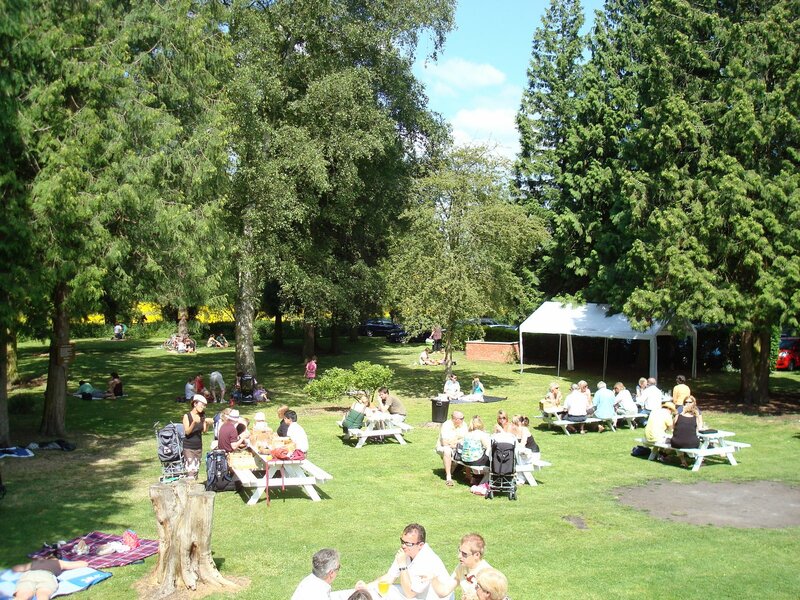 and you can have your little picnic there which you can pick up in a pretty picnic box from the pub. You can’t have any hot food though and we were keen for some Sunday lunch. Although it looked pretty busy, we were lucky enough to find a table to fit all 8 of us on the balcony. By that point, I was trying to avoid the sun because I could really feel my shoulders burning. I wasn’t very successful. Shouldn’t complain though, or the sun will never come back. We had the choice of, well, all the standard ones really: beef, pork, chicken and lamb. Only beef came in a individual portion so we had a pork for 4 (on the other half of the table) a pork for 2 and a lamb for 2 for the 4 of us to share. It was good. 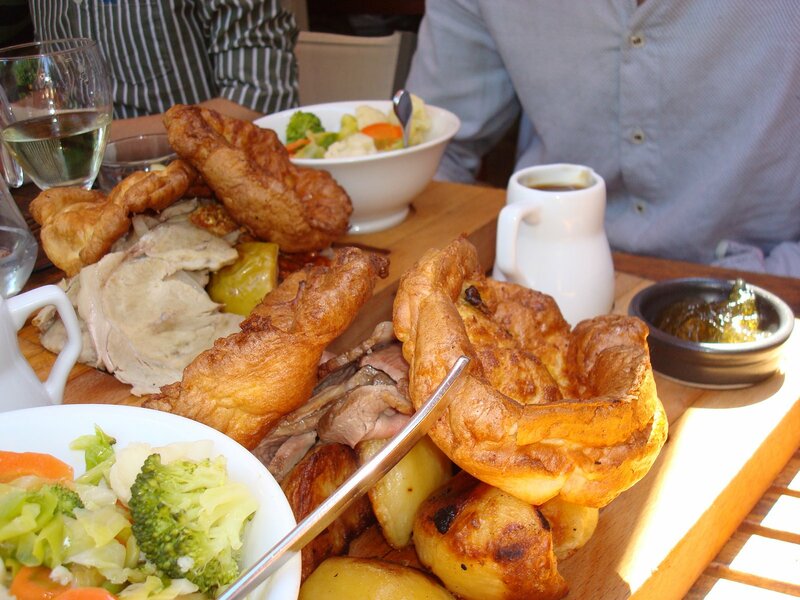 The pork was a bit dry, but came with good crackling and some roast apples which I loved. The lamb was tasty and most of us preferred it. They also looked cool on those big boards. I would have liked some more exciting vegetables than boiled carrots and cauliflower but it seems to be acceptable to serve boring boiled vegetables with roasts. Whatever. For pudding, I wanted to have the Summer Berry Crumble, being a crumble addict, but Alex had his eye on the Special Cheececake for two, and no one to share it with so I offered. 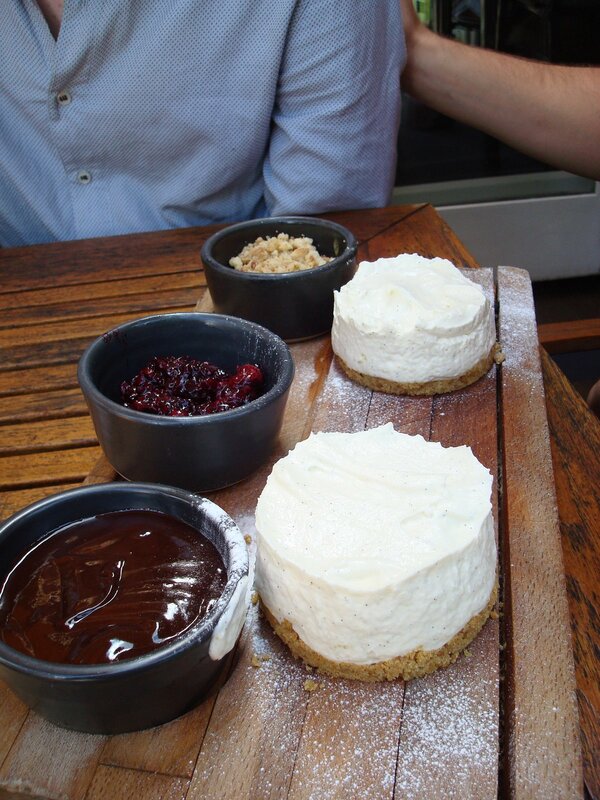 It was served on a wooden board, the two individual cheesecakes looked properly homemade, with loads of vanilla in the cream. There were also 3 pots of different toppings: the first one was some chocolate sauce which, although tasty, didn’t seem to compliment the cheesecake that much. That’s what I thought at least, Alex loved it! There was also some wild berry compote which was great, tangy enough to counteract the sweetness of the cheesecake. The last one was supposed to be granola and it was nice for texture since the base wasn’t very thick. As we were eating, the waiter came up to us, apologised and gave us the £10 pudding for free. Apparently, the granola wasn’t granola but biscuit. Oh no. All in all, the meal ended being a bargain, and pretty tasty too. I would happily go to The Fishes again if I didn’t live two hours away.